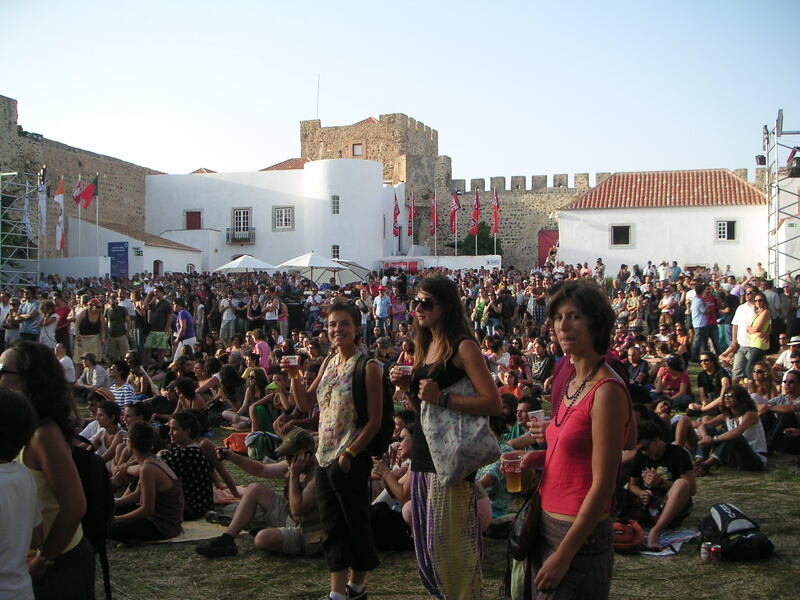 It is not a mega event but one of those smaller music festivals, the Festival Músicas do Mundo 2010 in Sines. World music and a very relaxed atmosphere. The Osho Garden community went to the opening night, 28 July. The main events take place in a Castle but there is also the Beach stage where we danced to African Woman by a group from Mozambique (can be viewed on our video channel ). Today started with Osho Dynamic meditation. The energy carried us through the work on our projects, a delicious lunch break and a cool jump in the river to an afternoon trip to The Land. Some roads were improved since our last visit, probably by neighbors in order to facilitate the harvesting of their cork. It was painfully visible how much nature is damaged by the passage of a bulldozer. We do not intend to strip the cork from the trees on our land, we appreciate nature the way it was designed. Cork stripping results in severe dehydration and increases the forest fire risk. Without their bark these trees lose much of their vitality and beauty. 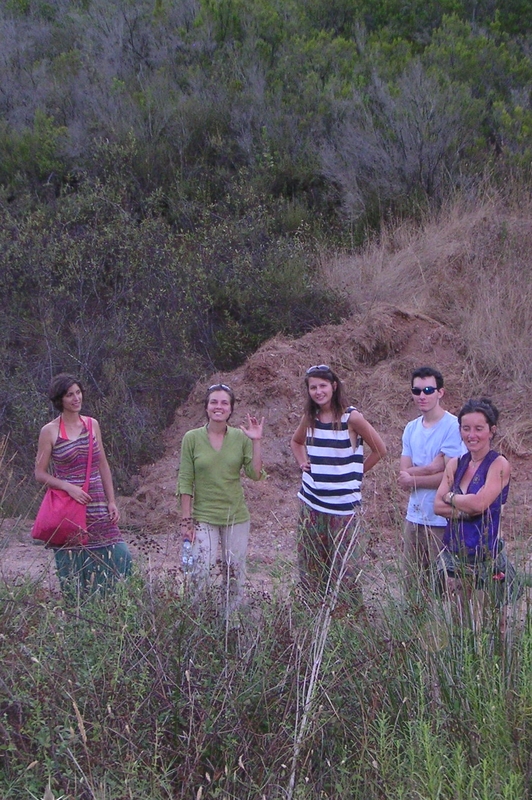 In this picture Léa, Daiva, Sahaja, better known as Sally, Greg and Miriam. 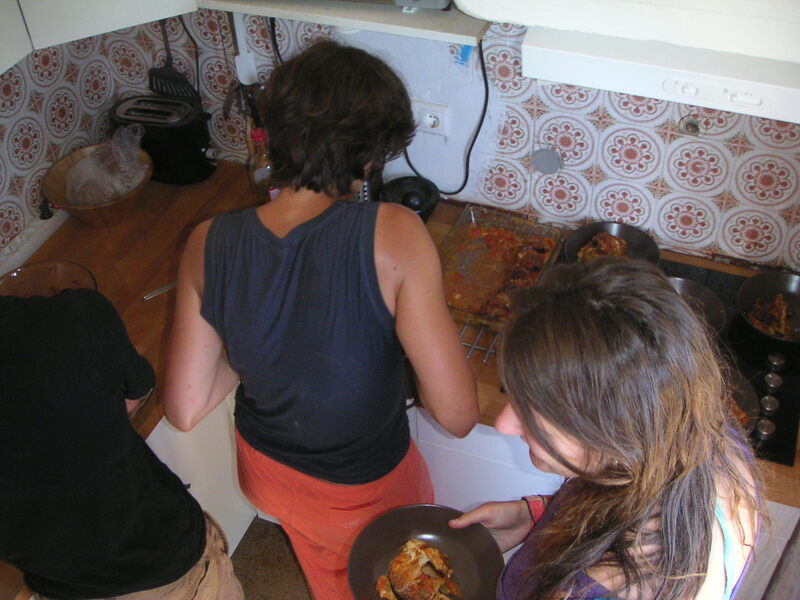 Every day twelve Osho Gardeners are crowding the kitchen at lunchtime around the délices culinaires. It works amazingly well but still we are looking forward to the opening of the space that we are renovating next to the kitchen. Here we can have our meals and meetings and sit inside where it is a lot cooler around midday than where we are eating now, outside on the front porch. 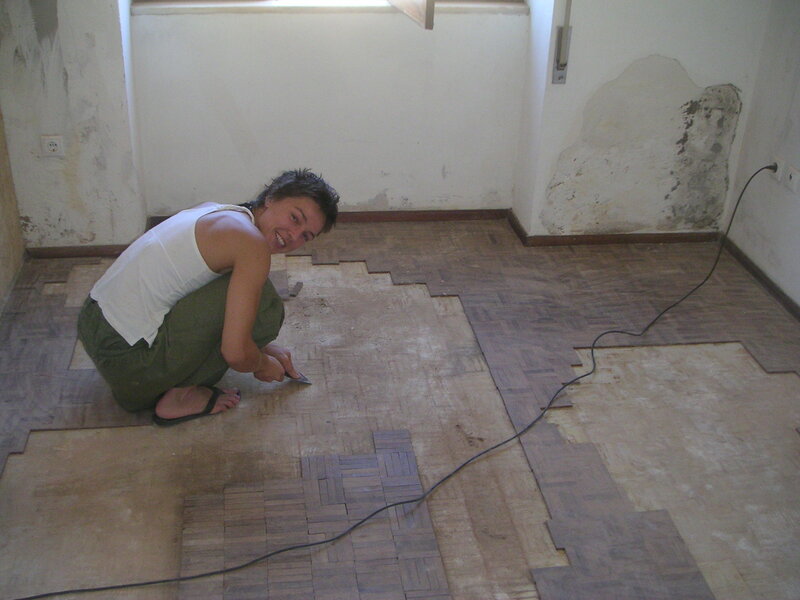 In the pictures below: Daiva who is managing the floor restoration project and Sergio aka Zaki who is plastering the arches, together with Shridar . You haven’t heard from me for a while. After sending out An Invitation we were waiting for you all to be ready to pack your bags and get on the road. And so it happened. 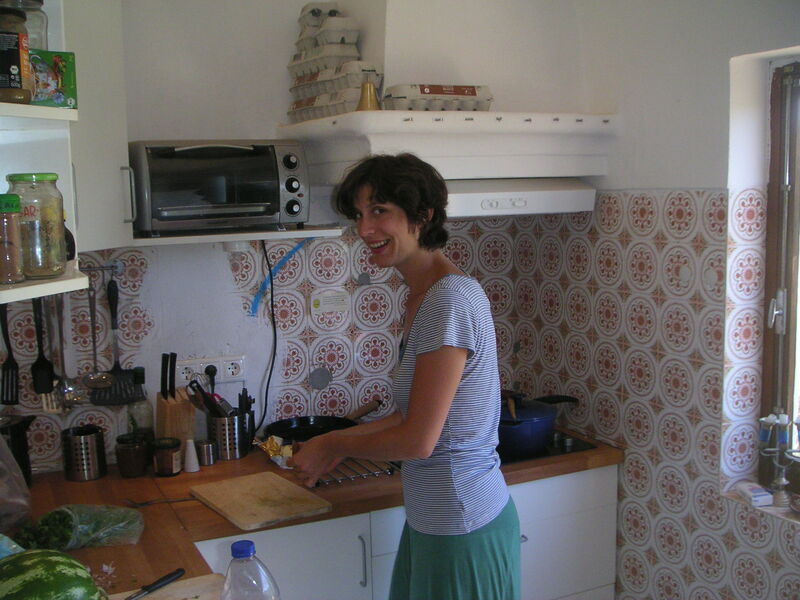 As I said before, the kitchen comes next to the meditation room in importance in a community like this and I am happy to announce that it is in full swing again with Léa, our new French chef de cuisine, the first of a new wave of volunteer workers at the Osho Garden project. Today she is assisted by Daiva from Lithuania who also arrived this week, as did Miriam, Shridar, Ekata and Dayaram from England, Bindia from Belgium, Sergio from Portugal and Greg and Sally from Scotland. And the well-known Portuguese-Belgian Zen Master Anudip*. 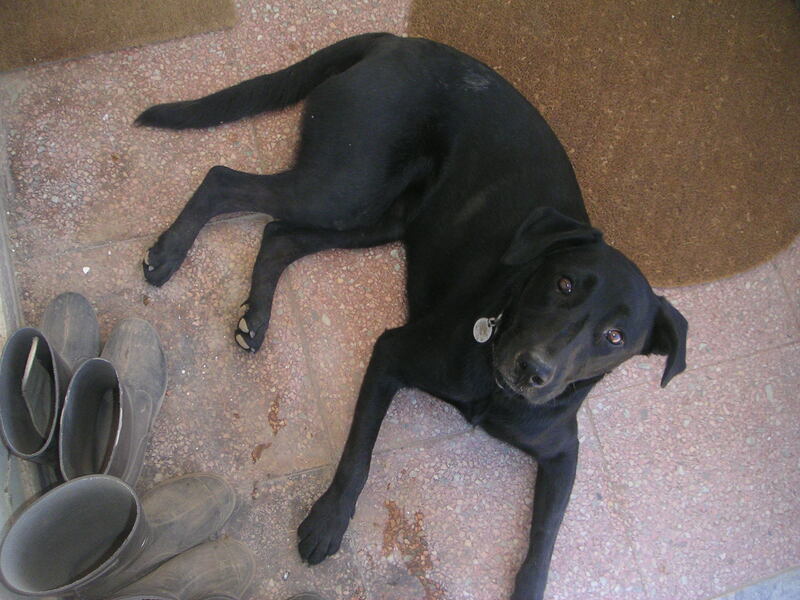 So we are with twelve now, including me, plus our distinguished visitor Trouble, a very friendly dog. For accommodation we have four caravans, a big tent on a wooden platform, two rooms in the house and visitor tents in the garden. We are working together on different projects about which I may have more news in the coming days. * Some of our names may sound unfamiliar to you. Osho used to give new names, mostly of Sanskrit origin, as a device to break the identification with the past and to symbolize the start of a new life according to our own conscious choices rather than our old conditionings.